BLU has just released its latest Android smartphone that promises quality specifications for a price that won't break the bank. 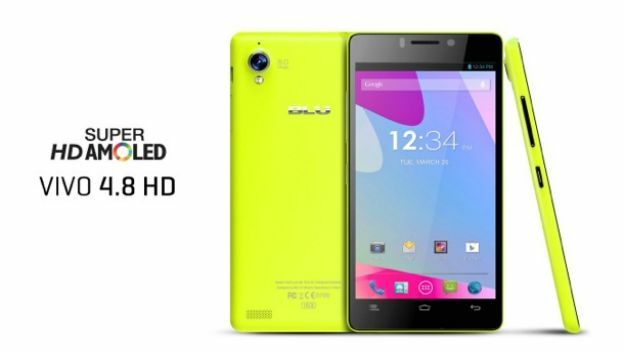 Android manufacturer BLU has launched the Vivo 4.8 HD, its latest smartphone entry that may appeal to those who can't afford high-end devices such as the iPhone 5S. Similar to the iPhone 5C, the Vivo 4.8 HD is a neon coloured, cheaper option with mid-range specifications that should do the job and some. It has a 4.8-inch, 720 x 1280 Super AMOLED display and runs Android version 4.2. Inside its slim physique, the Vivo 4.8 HD packs far from cutting edge tech: a 1.5Ghz quad-core chip, 1GB of RAM and 16GB of storage. Other features include an 8 megapixel camera and a 5-megapixel front-facing shooter. “We are dedicated and will continue expanding our VIVO smartphone series of smartphone devices, known for their Super AMOLED Technology displays, resulting in remarkably bright and vivid color reproduction, with the best viewing experience and contrast ratio available on a mobile phone today,” said Samuel-Ohev-Zion, CEO of BLU Products. It will be available in Matte Black, Ceramic White, Electric Neon Yellow, and Glimmer Pink. BLU is shipping the Vivo 4.8 HD to several distributors, dealers, and online retailers in the US and Latin America for $249 unlocked.